POWELL, Lazarus Whitehead, a Senator from Kentucky; born near Henderson, Henderson County, Ky., October 6, 1812; attended the common schools; graduated from St. Joseph College, Bardstown, Ky., in 1833; studied law; admitted to the bar and commenced practice at Henderson in 1835; member, State house of representatives 1836; presidential elector on the Democratic ticket 1844; unsuccessful candidate for governor in 1848; Governor of Kentucky 1851-1855; elected as a Democrat to the United States Senate and served from March 4, 1859, to March 3, 1865; resumed the practice of his profession; unsuccessful candidate for the United States Senate in 1867; died near Henderson, Ky., July 3, 1867; interment in Fernwood Cemetery. Dictionary of American Biography; Kentucky. General Assembly. 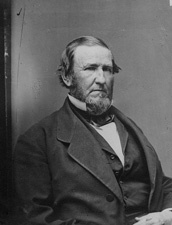 Biographical Sketch of Honorable Lazarus W. Powell. Frankfort: Kentucky Yeoman Office, 1868; Morton, Jennie C. "Gov. Lazarus W. Powell." Register of the Kentucky State Historical Society 4 (January 1906): 11-14.